*A parent must be present at all times. • Fitness Center Members need to present your ID card each time. • K-8 Parents must be present to sign in child. • Full-court games may be restricted, based on numbers. • Basketball games played to 11 points - each basket 1 point. • After three wins, a team must sit out until next available game. • Players must control their language, or they may be asked to leave! • Basketballs are not supplied. Please bring your own. Run, jump, slide or climb at Preschool Open Gym. You and your child(ren) will have a ball playing indoors and meeting new friends. Children ages 9 months to 6 years old can play, socialize and laugh in this open play atmosphere. 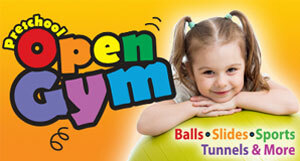 Balls, slides, sports, tunnels and more will be available for your child to play with. Parents must accompany their child at all times. Get a punch card, after 10 visits the eleventh is FREE.